Samsung pioneered this digital signage solution four years ago with its original Smart Signage series, and digital signage software developers working with fourth-generation smart displays now say a combination of faster hardware and the Tizen cross-platform operating system really raises the game. While early versions were limited by software and computing power, today’s smart displays rival what can be done with separate PC-based digital signage players. Smart displays had many doubters when they were first launched, but full networks are now rolling out based around smart System-on-Chip (SoC) displays. The cost savings is a big driver, but end users are attracted by a digital signage solution with a minimal cable footprint, and developers are drawn to some of the web tools that are finding their way into these screens. Kevin Schroll, director of digital signage product marketing at Samsung, concedes that early smart signs had their limitations, but the product has evolved significantly based on industry feedback and learning, as well as technology advances. 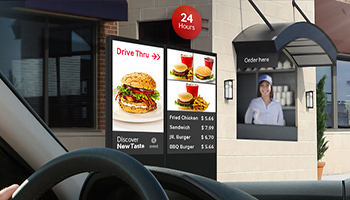 Smart displays started out as digital posters and menu boards — applications that didn’t require much computing horsepower to change a still poster image or switch prices on fast food menu displays. Download this white paper on the cost savings of outdoor digital menu boards. Sellen also likes the incorporation of new technologies like Node.js, which allows the smart displays to operate as mini-servers for their immediate surroundings. Additionally, improvements in both the hardware and digital signage software mean SoC displays are being used for interactive displays, running full HD video and even being “daisy-chained” by cables and synchronized to function as video walls. There are now scores of digital signage CMS software firms developing and marketing solutions built on top of SoC displays, but the real growth is with companies that don’t necessarily categorize themselves with the “digital signage” label. According to Jeff Shull, executive vice president of Air-Transport IT Services, Inc., part of the Amadeus Group, device management is one of their top priorities. “Samsung has shown strong dedication to this architecture, and we want to ensure that our development efforts are supported for years to come,” he says. Developers, says Chan, are attracted to Tizen because it represents a vast amount of thinking and development for mobile and other devices, and is very secure. “Samsung Knox security for mobile phones is U.S. Department of Defense-approved for use. And the same technology exists in our SoC on our Tizen displays,” he says. With its pervasiveness across manufacturers and commercial display lines, SoC and Tizen technology is here to stay. SoC is now being built into the majority of commercial displays; even specialty display companies are adding SoC processing power. The days aren’t quite over for external PCs and dedicated media players, but Smart Signage has matured into legitimate alternatives for many digital signage jobs. In order to fully reap the benefits of digital signage solutions, businesses must first develop a plan for determining the total cost of ownership.